Need a workspace but lack the room? We have solutions! We understand that not everyone has the space – or desire for – a conventional desk-chair setup, so we’ve pulled together six ways that you can design a workspace, even in the smallest of living spaces. The main requirements are some thought and creativity. Who says you need a dedicated space to work from home? Create a workspace using small pieces of furniture that can serve double purposes. Concealed electrical outlets, built-in USB charging ports, pull-out trays and drawers are features that give you the functionality you need for top performance. They look like typical end tables, but they’re not. 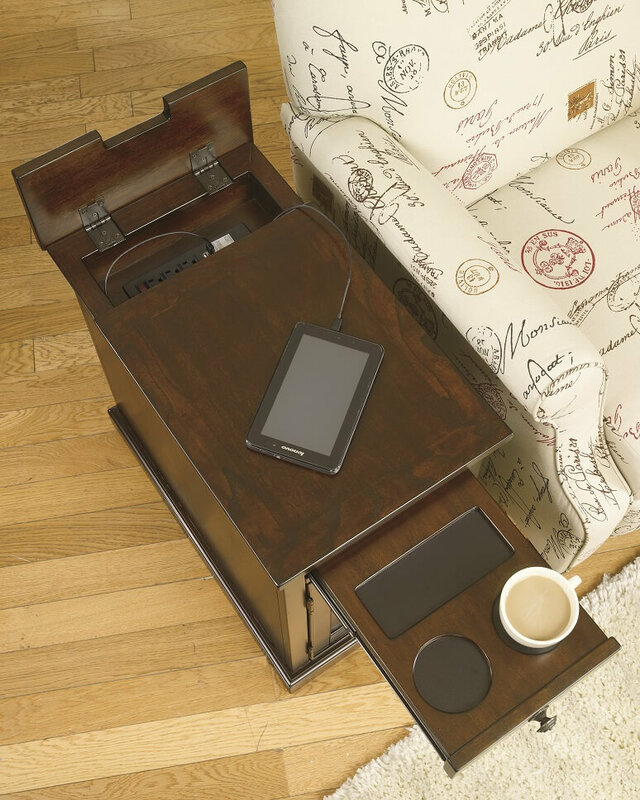 Often with sliding tops that open to reveal hidden storage compartments, you can hide a laptop or tablet—ideal if you don’t want to leave your electronic devices out in the open. File drawers make these end tables a compact, space-saving option. Look for pull-out trays with widths of at least 18” and depths of 11”—ideal for a regular-sized laptop. Lower cabinets, open shelves and cubbies offer lots of storage possibilities. You can easily tuck work away when guests arrive. 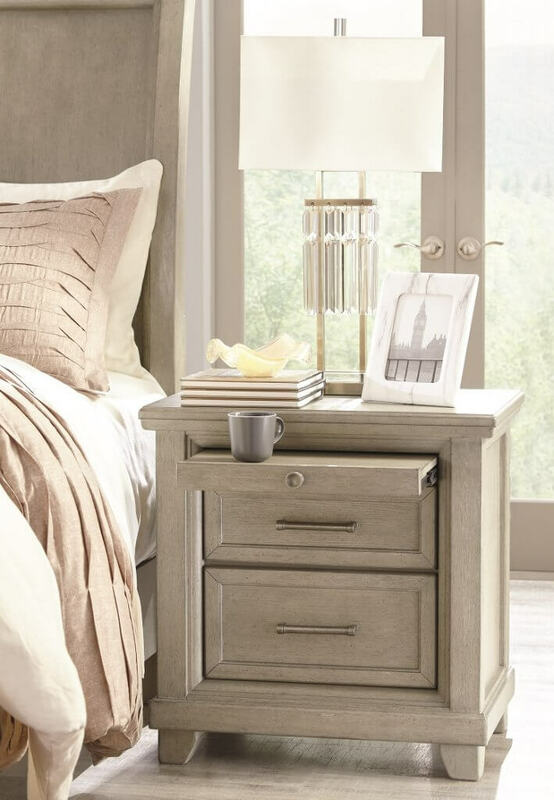 Traditional nightstands are limited to being repositories for lamps, glasses, and other necessities. Today’s nightstands offer lots of surprising bedside functionality, especially when you need a quick way to plug in your electronics. Create a workspace in bed using a backrest pillow and bed desk. If you don’t have room for a full-sized desk, use a small desk. This versatile solution can be used as a side table while also offering room to work. Turn to the walls for mounted workspace that doesn’t take up valuable floor space. The trick is to find an area you can work with. Finding open wall space is easier than you think. Consider all nooks and crannies, like the walls under the stairs, wide hallways, roomy stairwells, laundry room alcoves and door-less closets (you may want to remove the doors to create the space). Hang a wall mounted desk and you’ll love its flexibility. Many come with desktop drop downs that unveil compact workspaces with handy bill organizers, cubbies, corkboards and drawers. Pull up a chair and get ready to work. The smallest spaces can be transformed into a mini-office by using vertical space. Mount a wide shelf that will serve as your desktop, followed by as many narrow shelves as you want above it. Pull up a chair and you now have a convenient work area. Load the remaining shelves with office supplies, books and accents. For your safety, use wall plugs or attach desk and shelves to wall studs. If you spend a lot of time in the kitchen and dining area, incorporating workspace in these areas is a natural. Make it work with functional dining options that include shelves and drawers, so you can easily stow your work when it’s time to entertain. Who says you need a desk to create a functional workspace? For big projects, open the leaves of a drop leaf table and presto–you’ll have more room. Drop the leaves and you’ll have more open space. In tight areas, nestle a drop leaf table next to a sofa arm and top with a lamp. Now you have a table that serves multiple purposes: end table, desk and dining table. Make the most of a kitchen nook or any space by adding a counter height table. Now you can work with a bird’s eye view and have room to spread out the work. Look for tables with bottom shelves so you can set aside work when you want to use the table for other purposes. Install a drop down pendant light to illuminate your work area from overhead. 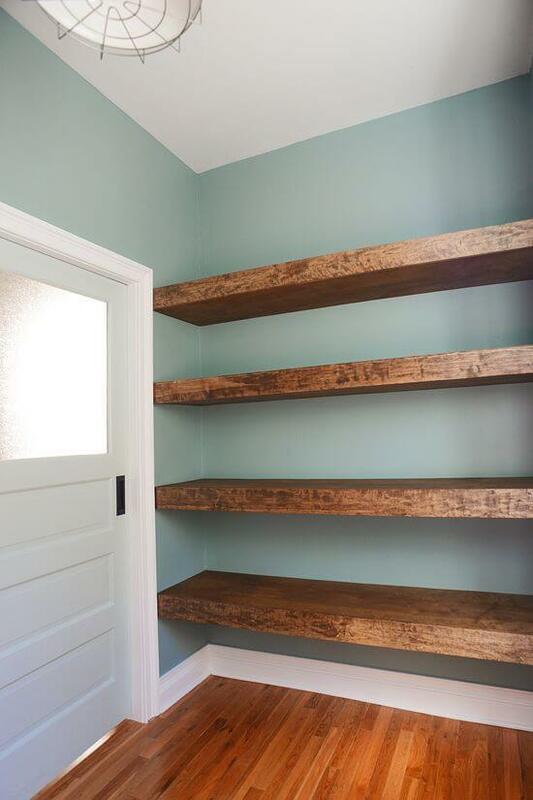 If you’re spending more time looking for things than getting the work done, line a wall with bookcases. Add stylish baskets or boxes to the shelves to keep office supplies within reach, yet hidden. If it’s large enough, a kitchen island can double as a workspace. Utilize one end as a makeshift desk and reserve the other for food preparation. The top surface of the island provides space to spread out, not to mention plenty of room for snack time. Drawers, shelves and cabinets come in handy whenever you need to stow away the work gear. Use adjustable height stools like this to work at a comfortable height. If you’re in a pinch or tight on space, some of the most typical pieces of furniture found in living rooms can easily be used for workspace. Be open minded about how you incorporate these pieces in your living room repertoire and enjoy the comfort. Add a console table behind a sofa or along any wall, pull up a chair or stool, and you’ve created an easy-access workspace. Look for tables with open cubbies or drawers to hold office supplies. Put two console tables together and you’ll have twice the workspace. When not in use, this table can double as a display space or buffet. Work in the comfort of your sofa or loveseat by placing a lift-top coffee table in front of it. Simply lift the top and you’ll have a flat surface at the perfect height for working. Look for tables that sport hidden storage and open shelves to keep everything within reach when you need it, and out of sight when you don’t. Some of the larger lift-top coffee tables have built-in file drawers, ideal for having easy access to your paperwork. Look for innovative desks, designed for flexibility and space savings. From modular to corner desks, the possibilities are endless, so be sure to take all your needs into consideration before you make a purchase. Torn between getting a bookshelf or a desk? Enjoy both with a space-saving bookshelf desk combination. If you have books, binders and supplies to house, an option like this offers the ideal combination of work surface and storage. AshleyGrottelTwoRegular; font-size: 14pt;”>Here’s an oldie but a goodie. Privacy and openness are wrapped into one with a traditional drop front desk. The front panel lowers to create an instant workspace, while the flip top hides the desk and storage area. Imagine placing this next to a sofa or bed—what a convenience. Don’t ignore a room’s corner space. Nestle a desk specifically built for corners and enjoy more room. On those beautiful days when you don’t want to stay inside, designate a spot outdoors where you can work on your laptop, hit the books and sit in comfort. A table with a lower shelf is perfect for holding work supplies. 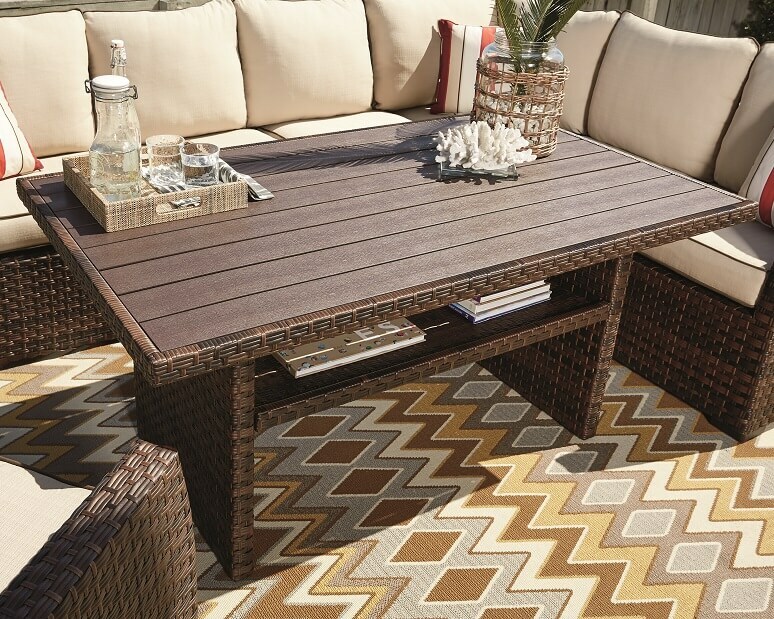 Include a table like this in a seating arrangement and you now have an outdoor setting for business meetings. Add a large umbrella to ward off the sun. Look for umbrellas with tilt mechanisms so you can adjust the canopy throughout the day. Not only will you be working, but you’ll enjoy the hassle-free warmth of an evening fire. 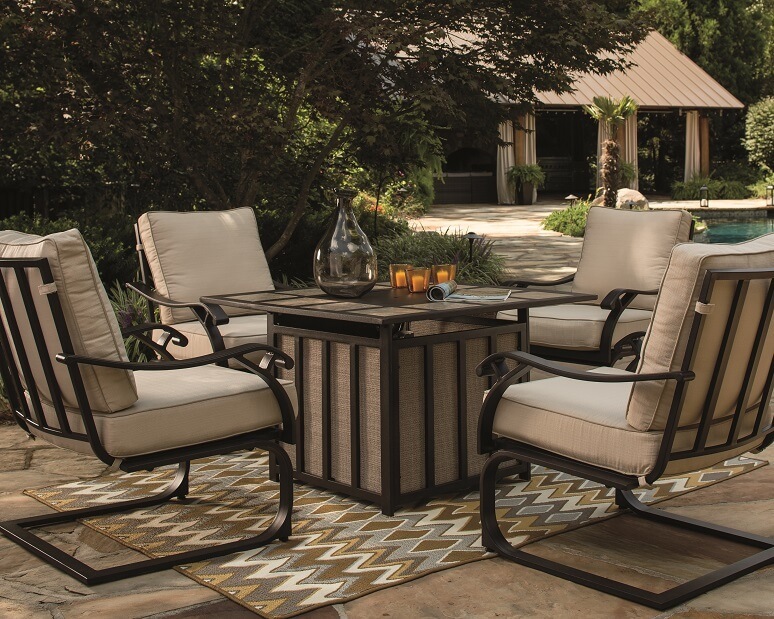 Why not get a fire pit table and create a tranquil setting to wrap up a day’s work? 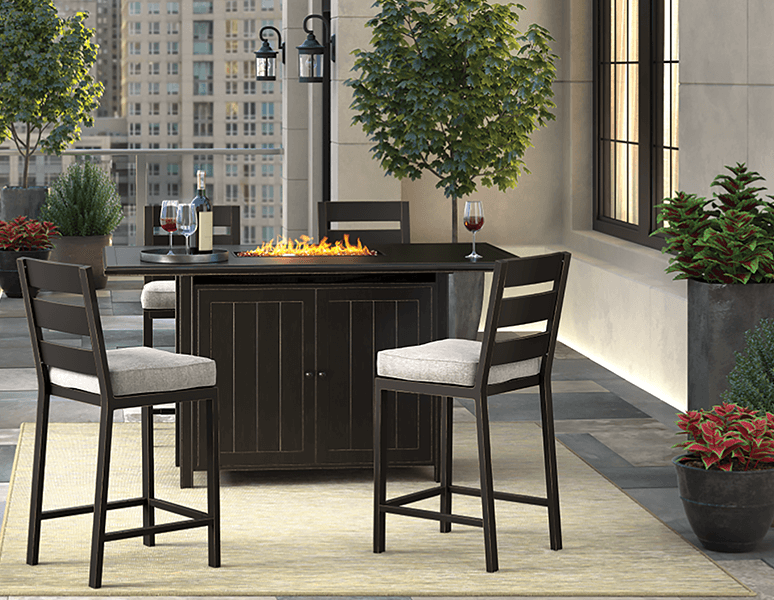 If you have a patio, porch or balcony, a narrow bar table set fits in beautifully. Pull up a bar stool—what a relaxed setting for getting work done, day or night.